As the school year comes to an end, many students may be looking for a fun activity to participate in this summer. 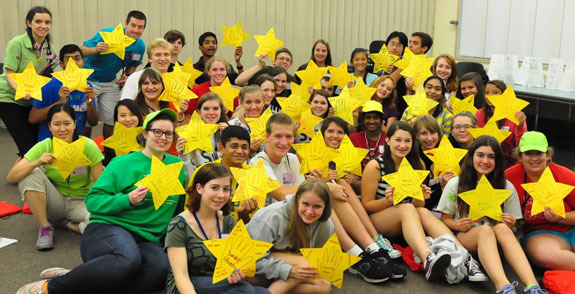 The Summer Leadership Training Program, held at Nichols College in Dudley, MA, offers students Grade 6 through Grade 12 the opportunity to strengthen their leadership and teamwork skills! Tuition is covered for the 5 days of the program, which has a 3:1 student to staff ratio. If you know a student who is interested in this program, fill out an application here or reach out to Program Director Liz Agosto (East Hartford High School Class of ’97 and Senior Associate Dean for Student Affairs at Dartmouth College) at lizagosto@gmail.com. On Monday, Rep. Porter (D-New Haven, Hamden) and I started the morning off with a visit of Prime Wellness in South Windsor, one of nine state-approved medical marijuana dispensaries. We met with Tom Nichols, CEO of the company, who gave us a tour of the facility. This year, the legislature passed a bill, (HB 5450) that provides medial marijuana programs for minors who are suffering from epilepsy. Growing research shows that a number of Connecticut's children who suffer from debilitating conditions, like epilepsy, would greatly benefit from a medical marijuana regiment. Connecticut now joins 17 other states in providing medical marijuana to minors. For more information on CT's medical marijuana programs, click here. 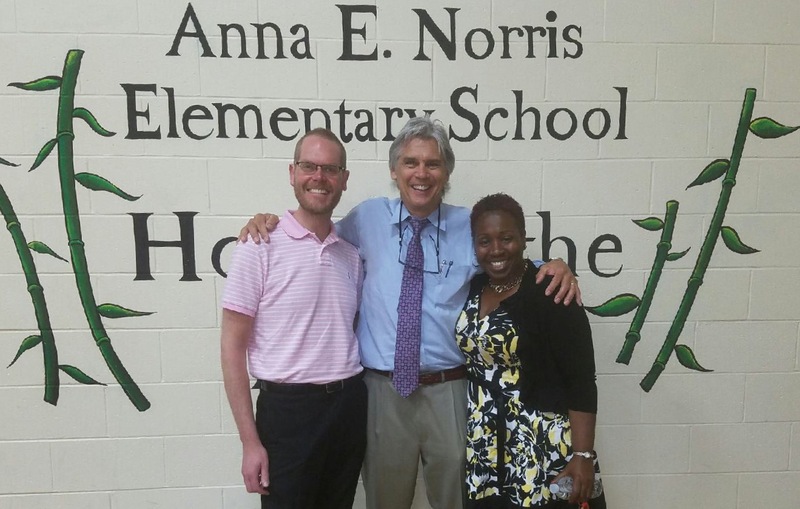 Later that day, we visited Norris Elementary School in East Hartford to talk about the gains the school has made through the CK3LI program. This program includes a school wide reading improvement plan, a comprehensive literacy assessment system, and high-quality reading instruction. Since using the program, Norris School has more than halved the number of students at significant risk for reading failure! I also had the pleasure of visiting CRIS radio, Connecticut's only radio reading service. This radio station serves people who are blind or unable to read due to other disabilities by broadcasting news and information published in 70 newspapers and magazines (50 general interest and 20 children's magazines) that folks need to stay connected. CRIS operates with the dedication of 300 volunteers at four regional studios and our broadcast center in Windsor. If you are interested in volunteering at CRIS radio, apply here. I had the chance to record a PSA for the Selective Service System. On Tuesday, Secretary of the State Denise Merrill and Education Commissioner Dianna R. Wentzell visited Timothy Edwards Middle School in South Windsor to announce the launch of the Red, White and Blue Schools Initiative, an initiative that will reward schools that develop programs that foster strong civic engagement among students. 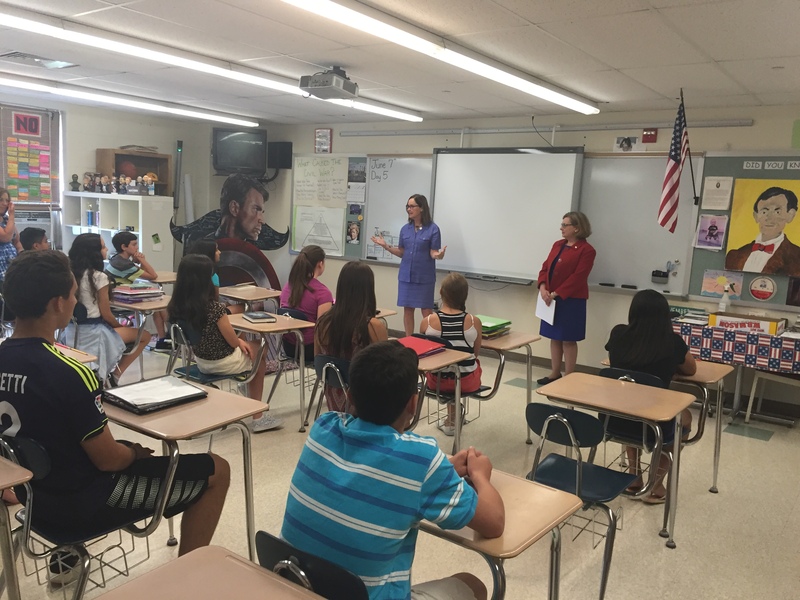 The program is available to all K-12 schools in Connecticut and will launch in the fall of the 2016-17 school year. On Wednesday, I attended the grand opening of Action Appliance on East Center Street in Manchester. Congratulations to the owner, Jay Miskin, and the General Manager, Doug Scheer, on the opening. I know this store will be a great addition to the Manchester community and I wish you both success in this business endeavor! I want to thank the Manchester Chamber of Commerce for their assistance with the opening! Anyone looking to join the Chamber of Commerce should apply here. 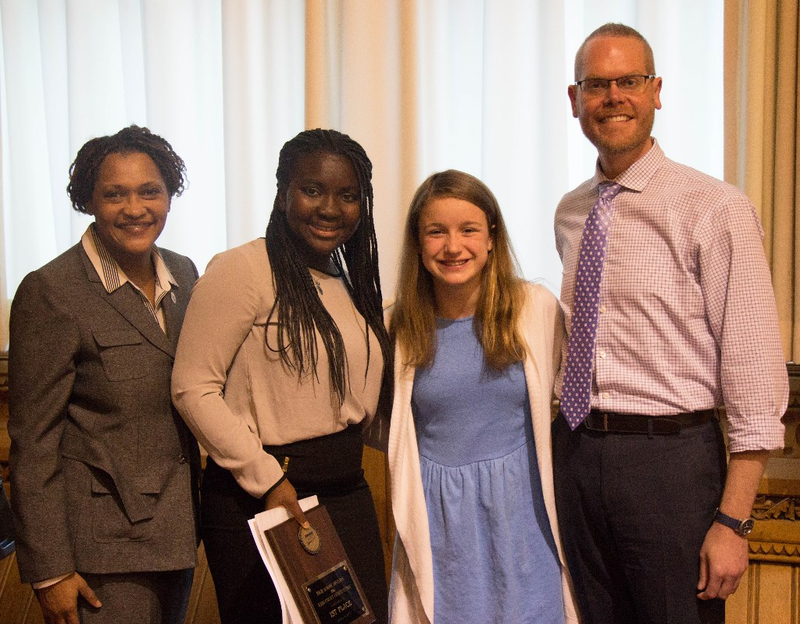 On Thursday, I had the opportunity to judge middle and high school students presenting their essays at the CT Commission on Human Rights and Opportunities' Kids Court Competition. These students wrote about topics ranging from race to sexuality to religion, topics that are difficult for adults to even discuss. I applaud these students for writing about the issues that are affecting our world today and for presenting their essays with such eloquence and grace. Congratulations to all the students who participated in this contest from around the state! This Saturday, June 11, as part of the state’s 12th annual Connecticut Open House Day, attractions from throughout the state will be offering special incentives throughout the day – such as free or reduced admission, free gifts, or special exhibits and activities – in an effort to encourage residents and visitors to explore everything the state has to offer. I encourage residents to take advantage of the special offers being given away at over 170 tourist destinations across the state. The Wood Library & Museum will be open Saturday, June 11th from 10 a.m. until 3 p.m. in celebration of the 12th Annual Connecticut Open House Day. Step back in time with our costumed docents as they give special interactive presentations on Native American Culture and how the fashions of the 1800’s helped create the Audubon Society. On Sunday, June 12, the town will hold a Garden Tour "Pathways and Blooms, which will feature a tour of 8 beautiful gardens, including two on historic Main Street, from 9:30-4 p.m. Tour tickets may be purchased by calling The Wood Library & Museum at 860-289-1783. For more information about the different gardens, click here. South Congregational Church, 1301 Forbes St., will sponsor their annual Strawberry Fair on Saturday, June 11, from 9 a.m. to 2 p.m. Plants, books, jewelry, baked goods, handmade crafts and more will be available for sale. Freshly made strawberry shortcake featuring homemade biscuits and real whipped cream will be sold all day, either to eat in or take-out. The Chuck Wagon will also sell hot dogs, hamburgers and French fries. Call 860-568-5150 for details. The 25th annual Pride in Manchester event ends this Saturday. For a list of the remaining events, click here. This weekend, there are also many events for our K-9 Companions. Tomorrow, Manchester is celebrating "Dog Day" where residents can bring their dogs to a low cost rabies clinic at the Manchester Fire Station or visit the town hall to purchase a dog license. Then, on Sunday, the Manchester Youth Commission will be sponsoring a dog swim, the "K-9 Kerplunk Doggie Dunk," from 10-12:30 pm at Globe Hollow Pool, 100 Spring Street in Manchester. Pre-registration is not required. Please contact Kellie Sheridan (860) 647-5262 with any questions. The South Windsor town council this week has voted to waive building permit fees for homeowners repairing their failing concrete foundations. Residents effected will be able to save $15 per $1,000 for a building permit and $10 per $1,000 for a certificate of occupancy. To read more about the town council's decision to waive permit fees, click here. June is Work Zone Safety Month and I wanted to remind everyone to "Obey the Orange." As soon as you come across orange barrels, lights or signs, prepare to slow down and leave extra room between you and the car ahead of you. DOT statistics from 2000 to 2014 found that the top reason why cars crashed in work zones is because vehicles follow too closely. In the 15 years prior to 2014, following too closely was cited for contributing to 5,329 accidents in or near designated work zones. For more information, read this Hartford Courant Article. Connecticut's defense industry is set to receive hundreds of millions of dollars in the next federal budget for fighter jets made by Pratt & Whitney, submarines by Electric Boat, and Black Hawk helicopters produced by Sikorsky. Last summer, Connecticut was added to a program known as the Investing in Manufacturing Communities Partnership, intended to strengthen manufacturing in the U.S. by supporting states that have put in place economic development strategies and have a strong manufacturing presence. For more information about CT's defense industry, click here. Department of Labor-low wage Employer Advisory Board Meeting, LOB 1D, 3 p.m.
Rep. Walker Juvenile Justice Policy & Oversight Committee Meeting, LOB 2D, 2 p.m.
Sen. Cassano: CROG/Next Gen Economic Dev.-Anchor Institutions, Neighborhood Investment, LOB 2C, 8 a.m.
For a complete list of meetings/events, visit here.